"Hello Daniel Conner here and I am writing this letter because I wanted to send an update. 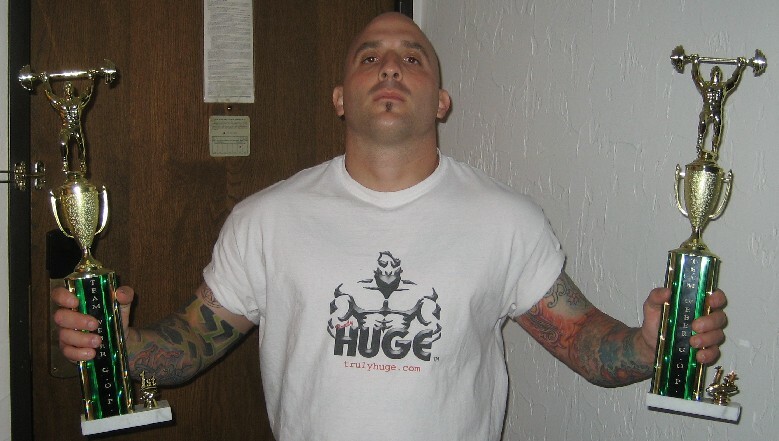 I have included a pic of me wearing the Truly Huge T-Shirt with the trophies I had won that day with a record raw bench of 505# at 187# bodyweight. I have found nothing in the way of supplements that has come close to the effects I had gotten using your Andro Shock and Nitrobol. Powerlifting supplements, here you find the best powerlifting supplements that work from our line of Truly Huge supplements for powerlifters. Welcome to the Truly Huge Bodybuilding and Powerlifting site! Truly Huge has long been known as offering only the very best high quality products. Our supplements are great options for powerlifters to help with their strength building workouts. Below you will find our top supplements for powerlifting. Be sure to click each link and read up on some of the best powerlifting supplements available anywhere! ANDRO-SHOCK - Is an androgenic formula testosterone support stack that may be the most potent legal testosterone support formula available. It is a safe alternative to steroids with powerful ingredients that help boost your body's natural levels of testosterone. NITROBOL - Is a amnio acid protein supplement that is fully absorbed in the body in less than 23 minutes, this gets the muscle and strength building aminos into your muscle cells as fast a possible. The most important time to take this supplement is immediately after training. PUMPED EXTREME - Kre-Alkalyn Pumped Extreme is the world's only 100% absorption Creatine. This amazing supplement assists in the muscle building process and helps you experience intense lifting with less fatigue. Increases strength and power, and helps build lean muscle mass. ECDY-BOLIN - Is a cutting edge dietary supplement introduced in Russia. Ecdysterone is shown to increase hepatic protein syntheses, which in turn promotes nitrogen balance. This is essential for added strength and muscle mass. This supplement increases strength, lean muscle mass all while reducing body fat. JOINT SUPPORT SUPPLEMENT - It's true bpowerlfiters and others involved in athletics cause a lot of stress, wear and tear on their joints, and need to take a joint support supplement to keep their joints strong, healthy and pain free. Power Joint Formula was designed to be strong enough for athletes, bodybuilders and powerlifters. It contains only the highest quality, most effective ingredients. HGH SUPPLEMENT - HGH plus IGF-1 supplement is extremely effective when sprayed under the tongue. This spray is all natural, and stimulates the body to increase production of human growth hormone. HERBAL FAT MELTER - Fat burners operate on the principle of thermogenisis, which does three things: First, stored fat is being burned for energy. Second, fat cells are broken down and mobilized. And third, raises metabolic rate to burn stored fat and keep fat cells from enlarging. The idea is that if they can raise your metabolism even a little bit, you will burn more calories each day, even while resting.